We all know that sentiment on gold is quite bearish. Rather than post numerous charts that you’ve likely already seen, I want to note some of the recent statistics. By recent, I refer to the past two weeks. Market Vane’s bullish consensus for gold hit its lowest since 2001. SentimenTrader.com’s public opinion, which combines various surveys, touched its lowest level since 2004. GLD has seen outflows for 41 consecutive days. Its monthly outflow was the largest since inception in 2007. According to BullionVault and COT data, speculative bets against gold are the highest since 1999. The recent commercial short position was at its lowest since late 2008. Anecdotally speaking, we see confirmation of sentiment reaching a major extreme. There has been an absolute explosion of negative press toward gold. 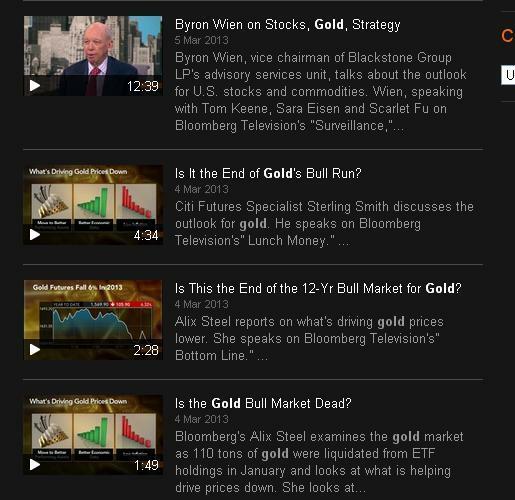 Before I wrote this piece I checked Bloomberg’s recent headlines for gold. Here is a screenshot of the top results. Three of the four stories are questioning if the secular bull is over. As I am writing, I notice that the top story on CNBC’s website is titled: Gold’s Warnings Surge as Banks Jump off the Bandwagon. Nomura is cutting its outlook citing a deteriorating investment environment. Analysts from Societe Generale say the market is in bubble territory. Goldman, BNP Paribas, Credit Suisse and Citi have all cut their outlooks in the past two months for Gold. Gold outlook: Should you follow the money managers or bullion banks?